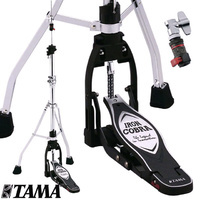 The perfect counterpart to Iron Cobra 900 Series bass drum pedals, the Iron Cobra 900 Series hi-hat stands offer incredibly sensitive, lightning-fast action, maximum adjustability and completely noise-free operation. The latest innovation on these stands, the new "Quick-Set Clutch", allows hi-hat cymbals to be quickly attached and removed. The Hinge Guard Block on the footboard holds the bearing more evenly, minimizing stress and maximizing smoothness. By tilting the bottom hi-hat cymbal, you can get a crisper and clearer hi-hat sound with your foot. 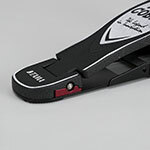 With just one touch, the Quick-Set Clutch can be attached or removed - simply push the button on the side of the clutch. 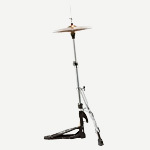 The clutch also allows the top hi-hat cymbal to float more freely, maximizing the natural resonance of the cymbals. 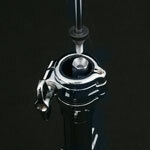 Like Iron Cobra pedals, footboard angles on Iron Cobra hi-hats can be adjusted. 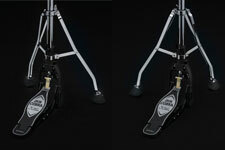 You can perfectly match the angle between the hi-hat footboard and the slave-side footboard of your double pedal. 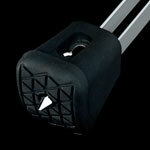 Specially shaped plastic and metal nuts fit together perfectly to keep the cymbal rod from loosening while playing. 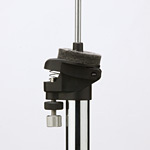 No more tension rods getting bent out of shape during transport! With Spare-The-Rod, you can save your tension rod the rigors of the road by packing it in the specially designed upper section pipe. 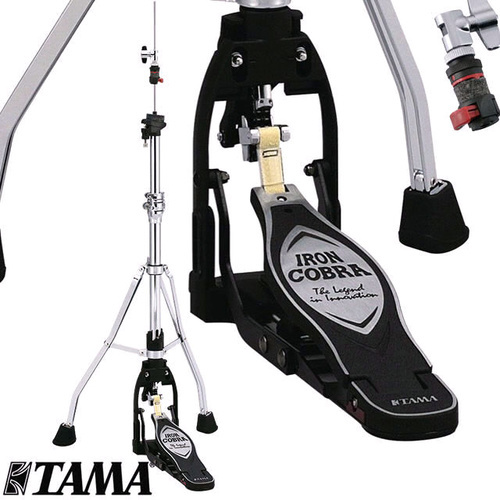 It's a small, but very significant TAMA hardware innovation. 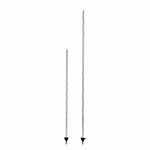 1.Insert the tension rod into the upper tube. 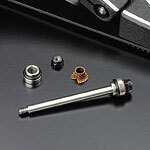 2.Hold the tension rod in place with the hi-hat clutch. 3.Done. The upper tube covers the tension rod. Our two-leg design is not only easier to set up in limited spaces, it's actually more secure than the standard three-leg design. The secret is in the small stabilizer under the footboard which effectively shifts the balance and strength of the stand toward the player. Since there's no steel plate under the footboard, Iron Cobra hi-hats are foldable for quick set-up, fast tear down, and easy portability. 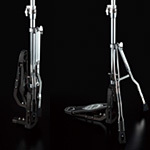 Not only do Tilt equipped stands offer more flexible set-ups, they also offer more expressive hi-hat work because you can tilt the hi-hat cymbal. 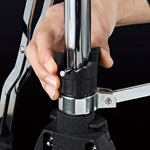 Iron Cobra hi-hat stands can be tilted quickly and easily by loosening just one T-Bolt. Six different levels of tension can be achieved quickly by using the six easily visible settings. It's called a stand because it's not supposed to "walk"-and our Duo-Spike makes sure your Iron Cobra hi-hat stands in one place. 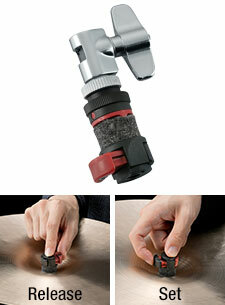 You can easily switch from rubber to metal by using a standard drum key. Since the foot pedal can be rotated around the dual leg base, the Swivel Foot feature greatly expands floor space and set-up flexibility. Our new Glide-Tite Grip Joint allows for a more secure attachment by using a metal-to-metal contact point. 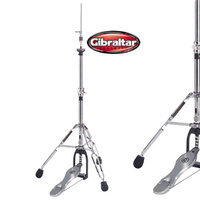 This provides an extremely solid anchor and complete isolation for a tom or cymbal. 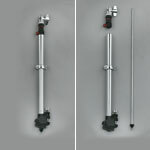 Because the stand does not move with the instrument, the natural resonance of that instrument is maximized. The construction of the Bearing Hinge on the footplate has changed from a one-piece assembly to two pieces. This design holds the bearing more evenly - minimizing stress and maximizing smoothness, while also adding to the pedal's sense of power. 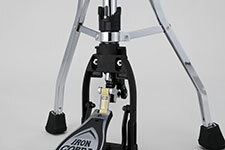 The new Iron Cobra hi-hat stands now come with both long and short cymbal rods, allowing drummers a choice based on their unique setup needs.